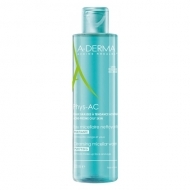 DESCRIPTION: Phys-AC Fluid from A-Derma is a complete triple-action care: its anti-imperfections active ingredients act in the bubbles, its hydro-compensating agents provide comfort and restore the balance of the skin with all softness, its patented anti-brand active will act on all brands and ensure a clean and smooth skin. 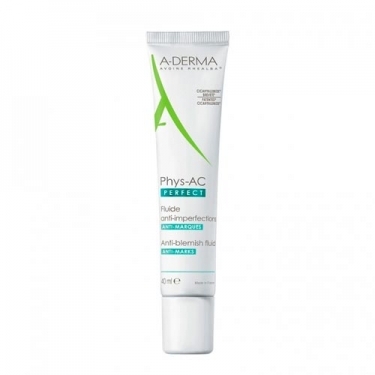 Reduces excess sebum and limits the adhesion of external agents. 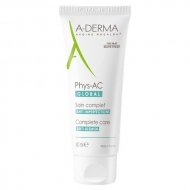 In addition, it calms and decreases the redness associated with irritation, exfoliates and descals the pores. For all this, their action is anti-brutal. 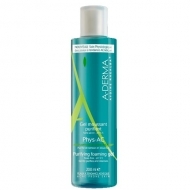 Its active galenics for optimum efficiency / tolerance ratio, progressively releases the actives smoothly. An ultra-fluid texture for fast application and absorption, ideal for use as a make-up base.